Lenovo is celebrating the 25th anniversary of its celebrated ThinkPad line with the "Transform Event" in New York City. The event showcases a number of firsts in the history of the venerable product line from IBM in 1992 to Lenovo in 2017. 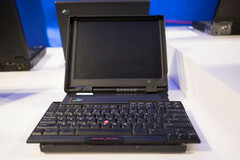 The first ThinkPad saw release in 1992 with the release of the ThinkPad 700 series. The 700 introduced the world to the TrackPoint nub that we all know and love, but it also packed a large 10.4-inch color display and a IBM 486 CPU — powerful mobile hardware for its day. In 1993, the ThinkPad 750c made its mark as the first ThinkPad in space. IBM noted with pride that there were around seven ThinkPads on any given shuttle mission. As ThinkPads were always square, boxy affairs, it was hard to fit a full-sized keyboard into the chassis while keeping the smaller ones portable. In 1995, the 701c attempted to remedy this problem by introducing a mechanically expanding keyboard that automatically folded into place as you opened the lid of the computer. It was not particularly a commercial success, but remains one of the most unique laptop designs to date. In 1997, the Thinkpad 560 (not to be confused with today's T560) was one of the first ultraportable laptops. In a time when most laptops were over 5 lbs and 1.5 inches thick, the 560 was a svelte 12.1-inch notebook that measured only one inch thick and weighed a scant 4 lbs. This was later refined with the first X-series ultraportable by IBM, the X20. The X20 was even more portable, weighing just 3.1 lbs. Though we are only just now seeing fingerprint scanners on nearly all of today's notebooks, this was another first for the ThinkPad series. Released in 2004, the ThinkPad T42 was the first laptop with a built-in fingerprint scanner. In 2005, Lenovo acquired ThinkPad from IBM and produced another first: the X41 Tablet had a swiveling screen that allowed the user to fold it flat and draw on it using a stylus. Carbon fiber made its way into ThinkPads in 2008, starting with the ThinkPad X300. For better or for worse, before the X300, most ThinkPads had magnesium or titanium composite shells. The use of carbon fiber allowed the X300 to weigh as little as 2.9 lbs. The final machine on display at the event is the current generation of the ThinkPad X1 Carbon. Weighing 2.5 lbs but packing a 14-inch screen, the 5th generation X1 Carbon is more powerful than all the other ThinkPads on display combined. What's next? The upcoming ThinkPad Retro, to be revealed in a couple of months, should be quite a treat for fans of the product line.